Private-Door enhances your life and simplifies your day by removing the barriers that doors become. With remote control convenience, you can open the entrance door to your home and avoid fumbling for keys when you are carrying a child or articles. With Private-Door, the door to your home will not be an obstacle to your independence and freedom of movement. The Private-Door Duo requires an electric strike release to be installed. 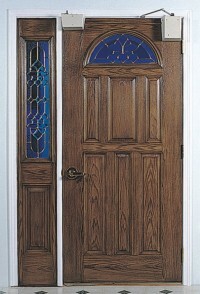 Electric strike releases are best suited when a door is being completely replaced and do not work well with retro-fits. To avoid a strike release see The Private-Door System. The Private-Door Duo is designed to automate the entrance doors to houses and townhouses at an affordable price. � Optional Remote Control Available. � 12-Volt Wiring eliminates expensive electrical wiring. � Obstruction Sensing stops door if contact with an obstruction occurs. � "Free Float System" permits the normal manual operation of the door. � Components virtually disappear when painted or stained. � Easy to install with simple hand tools. � Retro-fits virtually any existing door up to 36 inches and 100 pounds. � Zero Resistance: Private-Door powers the door on the open and close cycle. No spring closers needed as some competitors' operators require. � Minimum Force: Private-Door is designed to use a surprisingly small amount of power to reliably automate a full size door. The Private-Door Duo requires no high-voltage wiring. Requires an Electric Strike Release. Step 2: The Electric Strike Release operates. The electric strike release receives an impulse from the Private-Door, releasing the door latch. To read more about the Private-Door Retracting Strike release, click here. Step 2: The Door Assist pushes the door out of the weather stripping. Step 2: The Door Assist pushes the door completely shut. The Private-Door Assist will seal the door against the weather-stripping. Traditional electric strike releases use a solenoid that releases a hinged plate that swings out of the way to provide clearance for the door latch. The Private-Door Retracting Strike is designed with an internal motor that pushes (retracts) the door latch into the door. The door latch is retracted the same as if the handle was turned. Because the Private-Door Electric Strike retracts the door latch it maintains a stronger level of security then a traditional strike release. Because Private-Door Electric Strike retracts the latch, the wood door frame and its trim does not need to be cut for clearance. This feature provides a cleaner appearance. Unlike a traditional strike release, the Private-Door Retracting Strike also fits into a standard ANSI 4 7/8" metal door frame. One Commercial Round Stainless Steel Wall Plate $128. Two Commercial Round Stainless Steel Wall Plate $256. Redeem $50. Instant Rebate Now!